Fifty years ago, Robert Propst of Herman Miller created the ‘Action Office’- three freestanding walls that were to enable the user to create the office space they wanted. However, despite the original intention of giving flexibility to office workers, the Action Office and derivatives of it made by competitors led to offices becoming rows of identical cubicles. The freedom that had been promised by the original designs was manipulated into maximising limited space by putting as many cubicles as close together as possible. Half a century later, and Herman Miller have moved with the times to create the ‘Living Office’ – an office design consisting of numerous different spaces, allowing for the mobility and collaboration that leads to great ideas. When designing a modern office space, creating the possibility for this collaboration to happen is key. The first design director of Herman Miller said in 1930 “The most important thing in the room is not the furniture—it’s the people.” This still rings true today, the first step in designing your office space has to be consulting with the people whose daily working environment this is going to be. Find out their problems with the current design and any solutions they may put forward as to how things could be improved. From this you can then start to develop a plan of all requirements, which will then need further adaptation in order to work within your given space. Although instant messaging and emails have led to faster communication between colleagues, research has shown that this still cannot replace face-to-face interaction – nothing is faster than having a direct conversation with someone, and ideas can flow more easily between a team that is in the same space, not 5 rows of cubicles apart. Facebook is an extreme case of workplace collaboration in practice – their new headquarters have 2,800 engineers in one mile long room. They also recognise the important of having quieter spaces too, smaller meeting rooms and even individual offices where people can go when they need to be within a quieter space to focus. Finding the perfect balance between collaboration and focus is difficult, and this can only really be achieved by experimenting first. 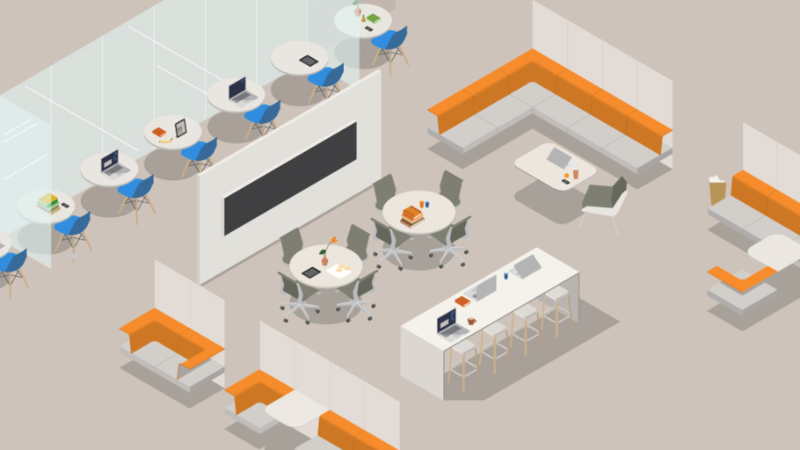 By having spaces that can easily be changed from working space into collaborative meeting or leisure areas, and back again, you can soon work out which uses of space yield the best results and continue to develop an office space that will ensure all employees, and the company, reach their maximum potential.